In 2012 Red Bull Teamed up with Syyn Labs to create a massive Rube Goldberg machine. It took 17 days to complete with over 100 people putting in 3500 hours of work constructing the “Kluge” (German for clever) from over 25 tons of materials. Once completed 11 pro athletes put the machine in motion. 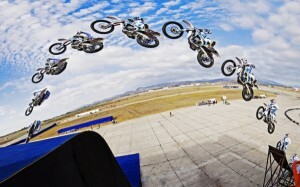 The video features athletes Sean MacCormac (Skydiver), Joey Brezinski (Skateboarder), Rickie Fowler (Golfer), Danny MacAskill (Trials Biker), Ryan Sheckler (Skateboarder), Drew Bezanson (BMX Rider), Bryce Menzies (Off-Road Truck Racer), Rhys Millen (Drifter), Robbie Maddison (Freestyle Motocross Rider), Lolo Jones (Hurdler) and Pat Moore (Snowboarder). The following video shows more details about how it was made. This entry was posted by Fresh Dub on August 14, 2013 at 5:11 pm, and is filed under Sports. Follow any responses to this post through RSS 2.0. You can leave a response or trackback from your own site.